It is always best to keep the immune system strong, so it can function optimally. We are all bombarded with immune stress in our daily lives from environmental pollution and toxins that affect our health in ways we may not realize. Chaga mushrooms are an immune modulator and “double-directional” adaptogen that powerfully balances immune response and helps the body maintain optimal homeostasis. Superoxide dismutase, also called SOD, is a natural antioxidant enzyme produced within the body that plays a significant role as a free radical scavenger. It acts as a “bodyguard” that essentially protects against DNA damage and helps to reduce the workload placed on the immune system. Chaga is one of the highest sources of this nutrient, offered in an easily utilized bio-available form. Powerful superfood adaptogen for the brain, nerves and immune system. Lion’s mane mushrooms a potent catalyst for brain tissue regeneration and helps to improve memory and cognitive functions. Studies have shown that the mushroom stimulates the synthesis of Nerve Growth Factor (NGF). Nerve Growth Factor (or NGF) is a protein that plays a major role in the maintenance, survival, and regeneration of neurons. A lack of NGF is considered one of the major causes of Alzheimer’s disease. It is required by the brain and important sensory neurons to keep the entire nervous system strong and healthy. Nerve growth factor is also known to stimulate and develop “new neuron growth” in the central and peripheral systems. Nerve Growth Factor is thought to play an important role in helping to elevate one’s mood, alleviate anxiety, and lessen the chances of depression. By far the best tasting coffee I have ever tried. 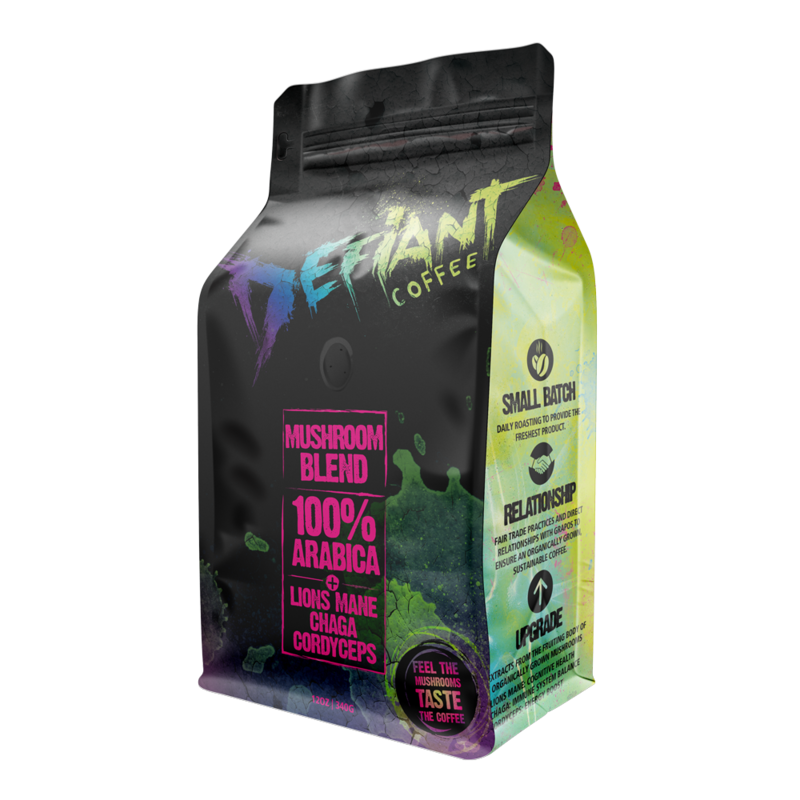 So smooth and savory with the added mushroom extracts, I feel more focused and energized than ever. I love this stuff. I don’t think I can start my day without a cup of this coffee, it makes such a difference in not only my morning activities but my whole day. Amazing! If you are looking for a great tasting coffee, with even better upgrades this is the coffee!! I was so impressed with the taste, and as a bit of a coffee snob, I take my coffee black, with a lot of judgement. I have now officially switch to Defiant Coffee exclusively.